Rheumatoid Arthritis, Lupus, Sjögren’s Syndrome, and other rheumatic and chronic pain conditions can cause ill effects on the hair for various reasons. Here, we’ll break down some of the “hair issues” associated with some of these conditions, and discuss hair care tips to have your locks looking their best, even with a chronic illness! 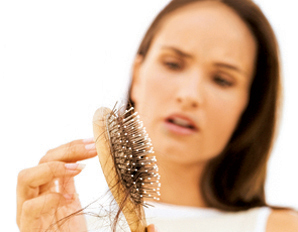 * Certain medications can cause hair loss or hair thinning. The DMARD Methotrexate is a main culprit for thinning hair or hair loss associated with RA. * Inability to care for hair. The disability caused by RA can make it difficult for patients to care for their hair as much as they could or should. Hair health may fall to the wayside because patients might have a problem washing, conditioning, brushing/combing, or applying products. Not caring for your hair properly can damage it, point blank. * Insomnia caused by RA. Sleep is when the body does most of its repairs. When we forgo sleep, it shows up physically. When the body misses out on sleep, hair loss can occur! At the very least, our hair may not be naturally repairing itself as much as it could. * Comorbidities. Co-existing conditions that come with RA can cause hair loss. Since RA is autoimmune, it many times is associated with other autoimmune problems. One of these is autoimmune thyroid disease. Thyroid and hormone issues can cause hair loss or hair thinning. Another one is Celiac Disease. This autoimmune condition is closely associated with vitamin and mineral deficiencies – and these vitamin and mineral deficiencies are vital for hair growth. * According to the NIHS, studies have shown that Sjögren’s-related problems with the skin—including alopecia (a condition characterized by hair loss) are becoming more prevalent. * Sjögren’s is characterized by dryness. This dryness could lead to dry hair, which also can cause damage to the hair. * Hormone deficiencies. Like many autoimmune conditions, Sjögren’s can throw one’s hormones out of whack. Hormones misbehaving can lead to hair thinning or hair loss, too. * Some doctors recommend DHEA supplementation for Sjögren’s patients. However, androgenic effects such as facial hair growth and hair loss in women can be associated with DHEA. * The inability to care for hair, comorbidities, and insomnia apply to Sjögren’s as well as RA. * Hair loss is a main symptom of SLE (Systemic Lupus Erythematosus.) About 45% of SLE patients will experience hair loss at some point. * Changes of the skin, hair, nails, and mucous membranes are very common in people with systemic lupus erythematosus (SLE), occurring in 85 percent of patients. * Medications used to treat lupus, much like other autoimmune and rheumatic conditions, can cause or contribute to hair loss or thinning. * The inability to care for hair, comorbidities, and insomnia apply to SLE as well as Sjögren’s and RA. It isn’t easy for anyone with these types of conditions! Some patients with polymyalgia rheumatic and myositis also experience hair loss. Ankylosing spondylitis patients, who are often on the same medications as, for example, rheumatoid arthritis patients, may also deal with thinning hair due to side effects from these medications. Additionally, STRESS can cause hair loss. As most of you know, living with a chronic illness or disability sure can be stressful at times….so it sure doesn’t help our hair health! * Invest in arthritis-friendly or adaptive/disability-friendly hair styling tools. * Deep condition your hair when you are able to; and use medicated thickening shampoos or products. * Take Biotin supplements (as long as your doctor agrees.) Biotin helps hair and nail growth and is a natural option. * Accessorize! Cute hats and scarves will help you cover your hair and will add some flair to your outfit! * Avoid over-styling/over-processing your hair, and if you must use hair-ties, go for the “ouchless” ones that are more gentle and won’t snag or tangle your hair, leading to breakage. * Apply almond oil to the roots of your hair at night. It is said to help growth! * Ask your rheumatologist about medical options to counteract side effects from drugs, if that is what is causing your hair issues. * Smile! A smile is the best accessory, and your gorgeous face will detract from any hair problems – just like that! * Forget about it! Just do your thing! If your hair is thinner than it used to be, find a new hairstyle that complements your hair changes. Have fun with it! As Lady Gaga (a lupus advocate herself!) says, we’re “as free as our hair!” — You’re beautiful just the way you are. Do you have any tips you’d like to add? Do share by leaving a comment! Tags: Arthritis, Arthritis Ashley, Arthritis Blog, Arthritis Foundation, Arthritis Foundation Mid Atlantic Region, Arthritis Tips, Ashley Boynes-Shuck, Autoimmune, autoimmune arthritis, Beauty Tips, Body Image, Caring for Hair, Chronic Illness, chronic pain, Disability, disease, Grooming, Hair Care, Hair Loss, Hair Loss in Women, Hair We Go, Juvenile Arthritis, Lady Gaga, lupus, Mid Atlantic AF, mid atlantic arthritis, Preventing Hair Loss, RA, RA Drugs, Rheum, Rheumatic Condition, rheumatic disease, Rheumatoid Arthritis, Rheumatoid Disease, Side Effects from Medications, Sjögren's Syndrome, sjogren's, SLE, Style, Systemic Lupus, Thinning Hair, Tips. Bookmark the permalink. Excellent article about autoimmune challenges to handling hair. With lupus much of the hair loss tends to be around the facial hairline. When it geows back in, there are often short stubby new “lupus hairs” framing the face. This is usually when I head to the beUtynshop for a new shorter cut that will blend in the short hairs with a perky new style. I agree heartily with the idwa of making the most of what is left! Thanks for the great tips. Leucovorin is folinic acid that can be added to the drug regimen to combat the hair loss of methotrexate. Most of our docs have us on folic acid daily, but folinic acid is small pill taken 24 hrs after methotrexate, and helps without cutting down on the main drug’s efficacy. My doc offered it to me when I complained of hair loss. Why do we have to ASK these things?